Longé Magazine was created for today’s avid and trendy reader looking for the inside track in business, finance, entertainment and fashion. 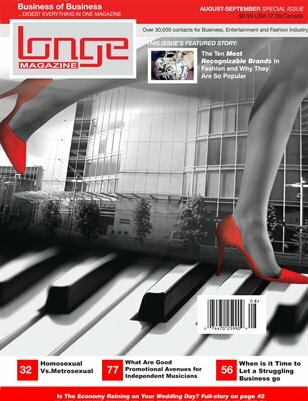 Unlike other magazine companies that use manipulative tactics to attract their readers, Longé Magazine sets out to create a magazine focusing on the reader's craving for an informative source that provides a clear direction, resources and testimonies from entrepreneurs while simultaneously not having the stylistic tone of a lecture. Moreover, the information provided in the magazine would be easily applicable to the real world as readers take on the challenging yet rewarding task of starting a business. 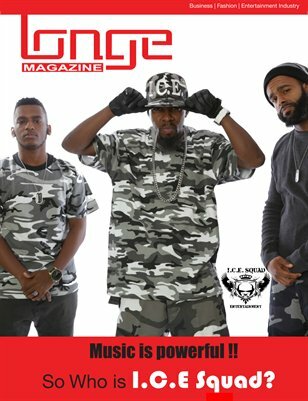 Longé Magazine provide more than just articles, we focus on branding and development for our members. 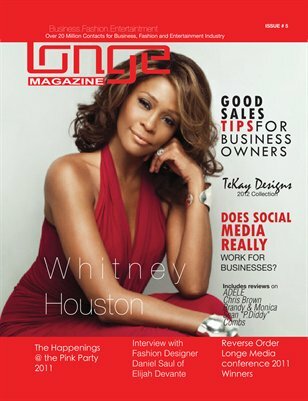 Longé Magazine services such as Sales Leads Generation, Social Media Marketing, Products/Services Reviews and more. Resources on Business, Fashion, And Entertainment. 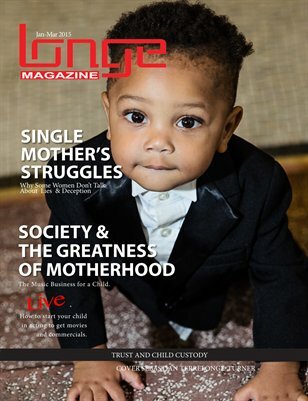 Longé Magazine is a dynamic reading piece that covers the essential details of how a business becomes successful. It will enlighten aspiring entrepreneurs with information on business structures and operations for the corporate, entertainment and fashion world. Its purpose is not only to provide success stories about businesses, but also to help create the future success stories for others. Our vision is to create a reading masterpiece that can become the manual for those wanting to start his/her own business. Furthermore, Longé Magazine wants to enhance the knowledge of those who may already own companies but might need more insight on what can potentially benefit or harm their business. Renee Terrelonge works for Longé Magazine and Distribution as the acting CMO (Senior Marketing). Ms. Terrelonge Hold a Bachelors of Science in Computer Engineering from the University of Hartford and Master of Science in Information Technology with Focus in Internet Copyright Laws. Ms.Terrelonge is responsibility for sales, management, product development in all the company distribution channel management, marketing communications including advertising and promotions. She is the primary person for pricing, market research, and customer service. As the CMO, she is faced with a diverse range of specialized disciplines to help increase the companies bottom line. This challenge is compounded by the fact that the day-to-day activities of her functions, which range from the highly analytical to highly creative (advertising and promotions). Beyond the challenges of leading here own subordinates, her responsibility is priorities and/or resources of functional areas not reporting to marketing such as production, information technology, corporate communications and public affairs, legal, human resources and finance have a direct impact on the achievement of marketing objectives. Ms. Terrelonge is the host of the "the Longe" Television show. Melody Ortiz works for Longé Magazine and Distribution as the Director of Marketing, responsible for translating marketing objectives into creative strategies, designs, and plans. Melody is a very detail-oriented with strong work ethics possessing strong organizational and communication skills. Prior to joining Longé Magazine, Melody started as a temporary position with Oce North America (originally called Pitney Bowes and then later renamed Imagistics International), yet during her 8 years working there, she was promoted to the position of Quality Inspector. At her temporary position, she independently studied and mastered Microsoft Word, Power Point, and Excel and became very computer literate due to her having to multi task within three laboratories (Digital, Engineering, and Alternate Source). Being very self-motivated individual and always thriving for more, she recently graduated with her Associate Degree in Liberal Art and Science at Housatonic Technical Community College in Connecticut and is seeking to enroll at University of Bridgeport Fall 2010 for her Bachelor’s Degree. Outside of work Melody attends Jehovah Rapha Ministries located in Bridgeport, Connecticut where she has been the Financial Administrator since 2006, responsible for all the banking transactions, accounting, and office paperwork. Over the years she assisted local churches with their financial Excel spreadsheets appropriate for their organization. Melody loves spending her free time volunteering with both the elderly and the youth in her community. Even though Melody is always smiling, energized, and enjoying life, she takes her work very seriously and continuously looks forward for positive future endeavors that can help her grow in all aspects. Music is one of Ace’s greatest passions, and he is constantly creating lyrics, working on his creative writing craft, and refusing to give up his aspirations. One could assume that Ace has a lot on his plate, but he juggles them effortlessly. For instance, after receiving straight A’s for his work during the second semester of his Junior year, Ace returned to Bridgeport on a Saturday afternoon (May 15th), went to a professional recording studio on May 23rd to record his whole upcoming mixtape in seven hours, and had wrote fourteen different songs during the in between week! Always willing to work in the face adversity, Ace has a strong work ethic and knows how to create, pioneer, and organize an idea, such as the Columbia University Society of Hip-Hop (CUSH) with which he co-founded with his classmates Mpho Brown and Jon Tanners. Due to his overall love for music, Ace has also been assigned to check out performing artists who send in submissions in order to write reviews that would then be published for Longé Magazine.